“I’m not a woo-woo person,” body-worker Roger Baril of Paonia says. Roger’s declaration was in response to my observation that I had detected no overt, mushy New Ageishness about his healing practice during an hour of conversation followed by an hour-long body movement education session. Roger is tall, thin, late middle aged with direct eyes and personality, but very open and welcoming. Ushering me into to his two room office in the Lamborn Building on Paonia’s central Grand Avenue, he immediately sheds his shoes and offers me a cup of green tea. It is eight-thirty in the morning and outside the first killing frost has put a period to most sensitive garden plants across the lower Valley. We acknowledge a shared interest in gardening and then spend an hour discussing his practice. I immediately leap on words such as “somatics” and “bio-kinetics” and “myo-fascial release”, wanting to know the reality behind each one and the degree of “woo-woo.” It turned out that the words that, to a person who has never been to a bodyworker/healer, seem a bit mysteriously opaque, but are no more so than most standard medical terms. Somatics, Roger explains, is our awareness of our bodies from the inside as opposed to being objects seen from the outside. Thus, somatic education is teaching the patient/client to be aware of how the whole body is working so that they can take action to correct and prevent bad things from happening. Is there a click when you bend your knee? How does your back feel upon awakening? How aware are you of your posture? Where do you feel the pain as you move a certain way? How does it feel when you move differently? How does it feel to contract an area and slowly release it and completely relax and sense the difference? To breathe deeply into any area with movement? Roger explains that many times chronic pain in the structure of the body is the result of developing a bad habit that gets locked in, and that learning proper body movement practice can correct the problem in a short period of time. Especially with the hands-on treatment. Roger takes pride in the fact that he is more than a one or two note bodyworker. While he is a Colorado licensed and nationally certified massage therapist he has also been trained in a wide range of disciplines. He is an expert in kinetics or kinesiology, the science of body movement, and has even developed his own flavor, Bio-Kinetics, to the point of trademarking the name. During an hour-long session during which I don shorts and t-shirt, Roger takes me on a review of most of the major joints of my body, explaining how things work or should work within a certain range of motions and a series of yoga-like stretching exercises that help maintain flexibility and mobility and awareness of movement with relaxation and contraction. He constantly urges me to be fully aware of how certain joints and regions feel, before and after a series of exercises. Of how the body parts, bone and muscles are connected to and affect, other parts. In the end it all seems very practical and common sense. I have been a runner since I was fifteen and think of myself as being in very good shape, but in just a few minutes Roger makes me aware of my limitations in general flexibility. We talk about how “healthy” people can benefit from massage and movement therapy and how a periodic tune-up from someone like Roger could be of great benefit. In fact, Roger works with skilled athletes, yoga teachers and dancers, helping to keep them at their very best in their practice. Roger says that much of his practice is dealing with people in pain, teaching them to manage that pain and even eliminate it by learning good body structure habits, along with the hands on treatment with myo-facial release/massage and somatic table work. This also aids in cutting back on or eliminating the need for pain medication like controversial, addictive opioids. On the massage side of things he does myo-fascial release therapy, something useful especially to physical trauma victims, like people who have been in car accidents. This involves manipulating the connecting covering tissue that hold the muscles in place that has become rumpled or bunched, basically smoothing and working it back into place. Softening the tensions. Roger is fully trained in how to work with special needs such as people with arthritis, rheumatoid arthritis and fibromyalgia. He works with patients of a wide range of ages. Roger is a State of Colorado licensed massage therapist and a member of the American Association of Massage and Bodyworkers. He is a Certified Massage Therapist, and nationally Board Certified in Advanced Massage and Bodywork Therapy. (NCBTMB). He has been in professional practice since 1989 and is a member of the Paonia Chamber of Commerce. He has lived in Paonia for nineteen years and maintains offices in Paonia in the Lamborn Building downtown, in Delta, and in Grand Junction. He is registered with the state as being able to accept referrals from regular doctors for patients with Workman Compensation insurance. Carol Welch-Baril and Roger Baril have been certified Neuromuscular Therapists since 1984. Five years ago they began studying Hanna Somatic Education and presently are Somatics instructors. Neuromuscular therapists who have studied Somatic Education with Roger and Carol find that it complements NMT beautifully, and Somatics provides them with an empowering way to educate their clients in the art of self-maintenance through increased self awareness. Q: How did you become acquainted with Hanna Somatics? As a long time practitioner of Tai Chi Chuan and body-mind centered therapies, I was naturally very drawn to HSE. When I read Hanna’s book Somatics: Reawakening the Mind’s Control of Movement, Flexibility and Health, I was struck by the similarity between Somatics and Tai Chi. Studying Hanna’s lectures on philosophical and theoretical perspectives of what it means to be a human soma has been extremely deep and insightful for me. Since I have been practicing clinical HSE for the last five years, I see the brilliance in his work consistently. Q: What is the theory and philosophy behind Hanna Somatic Education? Thomas Hanna was an exceptionally intelligent man with very deep insight into life from the somatic point of view and sound knowledge of the human body and neurophysiology. Hanna also possessed a doctorate in philosophy and was a long time student of Moshe Feldenkrais. These foundations explain in part why Hanna viewed people not as objective bodies, a third person viewpoint of the body as a separate thing “over there”, but a first person view point which sees a subjective soma “here”. These are two different relationships, two very different ways of thinking. To quote Hanna: “A soma then is a body perceived from within… The somatic viewpoint offers insights and possibilities that are categorically not possible from the bodily viewpoint that is the established perspective of physiological science and medical practice. “What each human experiences is himself or herself—an acting, sensing being. Experience, consciousness or awareness is a sensorymotor event in which sensing cannot be separated from moving and moving cannot be separated from sensing… This inseparability means that what we do not sense, we cannot move, and what we cannot move, we cannot sense.” It is very simple, but so overlooked. So when we bring more mind into our body, in terms of sensory motor awareness, we can bring more control of the synergistic functional capacity that we are tending to miss. We all need greater “wake up calls” in our healing process. So-many people I see after a session say “Wow, I had no idea I was so tight”, or I didn’t even know I could move that way”, or “l was really holding there and didn’t even know it”, or “I feel ten years younger”, “l feel two inches taller”, “l feel so much straighter”, “l feel so much lighter”, “l can move much easier.” Somatic education is not something you do to someone, it is something you teach. It is purely brain work. The mind is everywhere we can sense and move. We cannot control something we cannot feel. Kinesthetic awareness is the gateway to self healing or as Hanna put it “to our Godgiven right as human beings to freedom and autonomy.” We as somatic educators spend ample time in our own somatic development. Roger teaches clarification by manipulation of the shoulder in the horizontal plane. We also study neurophysiology and the anatomical body. We begin to see peoples’ conditions somatically from a synergistic wholistic viewpoint. Hanna often used the analogy of “going through the looking glass… to be on the other side of the looking glass.” That is, to see the person from the inside out, to feel the person in your own soma. When I’m working with a person I’m not thinking of working with this or that condition, rather I am trying to understand what is happening within, where they are stuck. I have found that I am a dynamic creative statement made by the whole of me. To change a posture is simple—live life fully. This means to be in the center of our hereness, to be conscious of what we are doing in the present moment. This is available for all of us. Q: How has your work with Hanna Somotics influenced you as a body-worker? I think that it can be difficult for bodyworkers of various kinds to make a shift to thinking somatically. It comes easier when we cultivate our own individual somatic potentials. I can no longer help but think somatically with my clients. I do not think in terms of what I can do to the individual but how I can help give them a greater experience of themself. It is always in my mind and dialogue to bring the person into greater awareness of where they are unconsciously holding. I have made a shift from a therapist to an educator, more specifically, a somatic educator. Q: What do you think would help a bodyworker make that shift? I believe we are very conditioned by the analytical mind which can become stiff or rigid, thinking the body has to be this way or that. We are dynamic, self-sensing human beings, able to make adjustments continually from within. We have been conditioned and limited by decades of antisensual education. We need to become free of that. To be a soma is to be sensory—motor. To overcome sensory—motor amnesia, learning must take place. As soon as we talk about learning we really can’t talk about bodies in that sense any more. lt’s a functional thing. When we think somatically, we think in terms of voluntary control, conscious awareness, movement, mental imagery, the means whereby things happen. It’s the “other side of the looking glass.” It takes time and practice in communication on a subjective first person level. Q: What kinds of results have you gotten with this work? First let me just say that in the continuum of muscular movement there is sometimes more tension, sometimes less. All activity, even inhibition, `U involves the organizing process of movement. An understanding of the organizing process is essential in learning how to do things differently because muscle tones can be altered by the neural centers of the spinal cord, or through higher brain synaptic junctions. We try to access the higher brain functions. I see so many smiles on people’s faces. What I see happen for people is an empowerment in themselves, a regaining of control, of relaxation in the true sense of the word. Hanna said many times that true and lasting change comes from within, not just from an external intervention. Just the other day a back hoe operator came in with chronic pain throughout his back and neck and shoulders. He had headaches daily. I watched him walk and move and I saw that he leaned strongly to the right and his right shoulder hardly moved. After the lesson he got off the table standing almost straight. He practiced the reinforcement patterns I taught him twice a day for the next lo days. When I saw him again, he was full of glee. I palpated his back to find it 90 percent softer. He had not had pain or headaches for the last week. We cleaned up the last bit in his neck and shoulders and that was it. I sent him on his way with another reinforcement movement. I have seen people overcome chronic sciatic pain, long term trauma pain, digestive and female cycle problems, many kinds of functional problems, sleeping problems and headaches. I have seen seniors stand up straight again, athletes overcome sensory motor amnesia, so many things—all in as few as six or seven sessions, oftentimes just two. Roger teaches lesson one to address the Landau reflex. The hips allow back control relationship. And people’s attitudes change too, to really wanting to take an active part in their healing process, enjoying doing their neurological reinforcement patterns every day. There are times when I am overcome with joy for them. Q: Do you follow a blueprint when you somatically educate a client? Hanna addressed people holistically in a true sense of the word, not symptomatically, since he saw so clearly the synergistic workings of the soma. He had great first person knowledge of kinesiology and a beautiful ability to teach it. He developed beautiful concise lesson plans to address different reflexes. His methods follow the form of what the individual’s needs are. I follow in general the direction of his lesson plans because they are brilliant, especially lesson one which addresses primarily the Landau reflex. The process is a beautifully organized blend of passive handling and active sensory—motor education. Q: How has this afected your own philosophy of bodywork and your approach to the body ? My palpatory skills, ability to see a person holistically and to connect with people as they are have really accelerated. It has taken many hundreds of hours of practice in getting to where I am now. Since studying Hanna Somatic Education and the work of Yochanan Rywerant, (who was a good friend and peer of Hanna and teacher of “Teaching by Handling,” the Feldenkrais method of one on one interplay), it is like the universe just opened up to me. It has profoundly affected not only the way I relate with, communicate with and see my clients, but how I see and experience my own life and potential to change and grow. As I work with people now, they continue to teach me more and more. I see what is needed by the response they give me to a guiding hand, to a verbal direction, or to any change in direction. Q: That is quite a strong statement. Yes, this is a very potent statement of clarity and I am beginning to see the possibilities within it. Roger teaches lesson one to address the Landau reflex bowing the spine. Carol talked about the pandicular response. Although it is the prime sensory-motor method used by practitioners of HSE, it is not, in and of itself Hanna Somatics any more than thumb pressure is NMT. Learning to teach the client to perform pandiculation in the exact and precise manner that is appropriate for the individual is neither obvious nor easy. To do the pandicular response in an A—B—C. manner on the shoulder with everyone is not how Hanna taught the use of it in his training. We need to again think somatically. lt is much more individualistic and integrated into the whole person. Addressing the whole person rather than isolated symptoms seems to be an important aspect of the work. Roger teaches lesson one to address the Landau refIex – cervical shoulder control relationship. Yes, clinical somatic education requires a comprehensive understanding of kinesiology and how pathological functions can occur, not just intellectually but on a first person level, as a soma relating to a soma. In a certain sense it is like putting yourself in another’s shoes. While I have taught many neurological reinforcement patterns and sensory—motor control exercises that I have learned through Hanna and other somatic pioneers, I at times will adjust them slightly or create something beautifully new with a client as I go inside with them and discover more line tuning capacities that brings them more in the core of their sensory motor control. Like Tai Chi, it is an endless and beautiful process of discovering and awakening for people. So clinical Hanna Somatics is a philosophy and a system based on thorough knowledge of ourselves in the body in which we learn to truly connect with another. It is generally organized in the direction of observation, palpation, movement, handling, pandiculation, moving, breathing, sensing and connecting it all together to overcome the whole body reflex habituation. We are engaged in a communication process and the clarity with which we communicate is the essential avenue to our success. Roger teaches lesson one to address the Landau reflex— “hanging” the spine. Q: How did you become interested in Somatics? I have had a longstanding curiosity in movement as a medicine for creating changes in a person’s physical, emotional and mental state. So, studying with Thomas Hanna was just a natural continuum of my personal explorations and studies in sensory-motor movement reeducation as well as ideokinesis and autogenic training methods using images and verbal instructions to alter conditions in the body. An interest in Somatics involves knowing oneself, regaining an internal awareness and wakefulness of what our potential is as human beings. Paul McKlean made a statement in his Nobel Prize speech that “Consciousness is a causative force in the human body. It reshapes the body.” Several years before studying with Thomas Hanna, the founder of Hanna Somatic Education (HSE), I studied dance with a man named Luigi, who had survived a horrible car accident in 1946 in which he received a basal skull fracture. In the process of rehabilitation and getting back on his feet and learning to dance again, Luigi taught himself how to condition, strengthen and control the body in an innovative way. Luigi was living proof that the human being is autonomous. Hanna used this term to emphasize that we are self-correcting, self-regulating human beings. The human being is made and designed to be free and self-directing. Autonomy is a genetic capacity intrinsic to all human beings. Now, movement is one way to activate this ability to self-correct. This is a similar principle among other Somatic educators such as F. M. Alexander, Luigi, Feldenkrais, Elsa Gindler. Turn conscious attention inward to the proprioceptive background of an objective movement and the quality of the objective movement begins to improve. 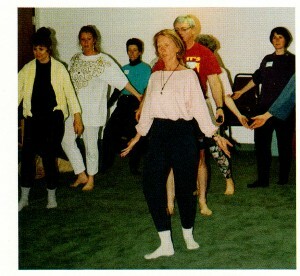 Carol teaches walking through the reflex patterns. Greater self-control is gained by means of greater sensory awareness. I consider that movement is infinitely more important than we might imagine. The works of these inspired individuals I’ve mentioned and many others, are a testimony to the universality of the recognition of the importance of movement to the totality of one’s life. Q: What does Hanna Somatic Education consist of? Hanna Somatic education (HSE) is the direct hands—on method for teaching voluntary, conscious control of the neuromuscular system to persons suffering involuntary muscular disorders. Somatic education is based on a very deep philosophy pertaining to what it means to be human and how the soma responds to day to day life occurrences. It has everything to do about movement. All of life is movement. Clinically it consists of a clear procedure of analysis and evaluation along with an awareness of the importance of re-languaging people’s problems into sensory terms, learning to clarify the relationship of a movement to the whole of oneself and to improve the quality of awareness and connection in a particular movement. Re-languaging is a strong part of Biokinetics. Milton Erickson called it “reframing” of a person’s problems in ways more conducive to improvement and change. Carol teaches lesson one to address the Landau reflex shoulder in horizontal plane relationship. The hands-on process of teaching involves a systematic blending of sensory motor clarifications, the purpose of which is to overcome sensory motor amnesia and different reflex habituations. The process focuses primarily on the pandicular response, the prime sensory-motor method used by practitioners of HSE. It is a sensory motor action used to arouse the voluntary cortex by making a strong voluntary muscular contraction and specific kinesthetic controlled release in order to feed back a strong sensory stimulation to the motor neurons. It is a way of “waking up” the sensory-motor cortex. Q: What is sensory-motor amnesia ? Hanna’s theory is that perhaps as many as half of the cases of chronic pain suffered by human beings is caused by sensory-motor amnesia (SMA). This is a condition in which the sensory motor neurons of the voluntary cortex have lost some portion of their ability to control all or some of the muscles of the body. lt’s a loss of memory of how certain muscle groups feel and how we can control them. SMA occurs neither as an organic lesion of the brain or of the musculoskeletal system; it occurs as a functional deficit whereby the ability to contract a muscle has been surrendered to subcortical reflexes. These reflexes will contract a muscle at a programmed rate and the voluntary cortex is powerless to relax these muscles below that programmed rate. It has lost or forgotten the ability to do so. Our loss of awareness and our alienation from our bodies is so extreme that we continually injure ourselves without knowing it, when we habitually hold ourselves in certain ways, let’s say locking knees or countless other things we do that are more or less damaging to us and chronically present in the joints. The strain is there is taking its toll yet it’s as if the sensory apparatus has become distorted and does not register the strain. SMA involves our unconscious holding patterns. SMA is treated as a functional problem and can be overcome by education, not by treatment. An internal process must occur whereby new sensory information is introduced into the sensory-motor feedback loop, allowing the motor neurons of the voluntary cortex once again to fully control the musculature. Q: How does sensory motor amnesia (SMA) occur? Carol teaches lesson one to address the Landau reflex highlighting the spine. SMA begins as any response we have in the present moment that is functional and life supportive. However, when our response persists longer than is useful as it does once it has become habitual, it becomes maladaptive; in a certain sense, a compulsive maladaption. Thomas Hanna distinguishes three reflexes with emotional undercurrents that may lead us to numerous pathologies: the trauma reflex, the startle (red light) reflex and the Landau (green light) reflex. These reflexes are very significant in the formation of human posture and are the hidden underpinning to a lot of physical problems. All three of these reflexes are built in the subcortex. The trauma reflex is a reflex of pain avoidance, a protective response. So long after an injury has occurred the system may still be preserving its reactive pattern to a fall, a blow to the body or surgery. The startle reflex is a stress response to threatening or worrisome situations whether actual or imagined. If this occurs often enough and strongly enough the musculature responding will become chronically potentiated. In startle reflex most of the contraction is in the front of the body and presents itself as high shoulders and caved-in chests. This is a sympathetic-dominant response and all the striated muscles, skeletal muscles and smooth muscles, including the veins and arteries, become contracted. Carol demonstrates movements to address the habituation of the startle reflex. Startle reflex has a lot of health consequences. This habituation creates shallow breathing, contributes to high blood pressure, rapid heart, constipation, bladder problems and numerous other conditions. The Landau response causes the posterior muscles to contract. It is activated by the reticular activating system which sends a charge of awakening through the whole system to let it know it needs to get ready for action. This reflex is triggered whenever action is demanded of us and by situations that are typical of life in urban-industrial societies. The constant repetition of these situations and the Landau response makes these muscular contractions chronic. The world of business is a world where as many as 80 percent of those over the age of 40 have pain and stiffness from chronically contracted spines from the pelvis to the neck. The effects of these three chronic reflex patterns are universally mistaken for “the inevitable effects of old age.” The pathway we somas use to overcome or regain conscious cortical control of these reflexes is Somatic education. Q: What do you mean by soma? What each human experiences is herself or himself as an acting, sensing, being. Carol demonstrates possibilities in trauma reflex re-education. A soma then is a body perceived from within. It describes the rich and constantly flowing array of sensings and actings that are occurring within the experience of each of us. Somas as opposed to bodies is not just a philosophical nicety to make a point, we are talking about a reality. It describes what universally happens in the human being as a person goes through life why we stand the way we stand and look the way we look after a number of years. There are two distinct ways of perceiving and acting upon a physiological process; as an object or as a subject. If I approach someone as a soma, I’m saying to this person, “You are a living, sensing being who is capable of learning how to change the way you move, hold and regard yourself.” An understanding of the organizing process is essential in learning how to do things differently. Hanna believed in what he called the myth of aging. Although skin and hair age, he believed that the body can remember and maintain its ability to be elastic. A way of maintaining that agility is by slowing down a movement and allowing time for learning and for sensory association. This internal awareness is the soma. Q: Are you implying that staying physically active as we age is not enough? Q: How does Biokinetics/Hanna Somatics complement Neuromuscular Therapy? It stabilizes what is achieved through NMT, which quiets the pain mechanism. Somatic Education grants awareness through greater cortical control. It is a way of waking up a part of the brain and is self-empowering. Somatics invites the health care practitioner to first recover from his/her own sensory motor amnesia. Hanna felt that those who helped others were not all that healthy and competent in their own bodies. So before we take care of others, we take care of ourselves. 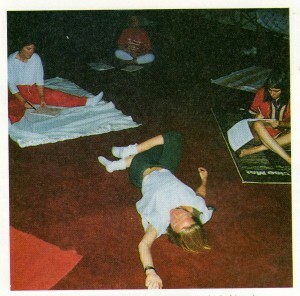 Q: What philosophical changes have you made since learning Somatics? For me it is not so much a change in my philosophy as it is a reawakening of what a precious thing consciousness is. Each of us is a self-making organism and moving sequence of varying emotional shapes. Dr Deepak Chopra, speaking of an old Indian, says, “All this struggle to learn when all we have to learn is to remember—to remember what we forgot—our own true nature—by tapping into our inner intelligence of our bodies—which is the ultimate and supreme genius—it mirrors the wisdom of the universe”. Copyright: Roger Baril and Carol Baril.